.S. Geiger holds degrees in composition from Michigan State University. While a student he was commissioned by the Opera Department to re-orchestrate Donizetti's opera Rita. A concentration on choral composition began with works for the Women's Glee Club and the University Chorale. His studies at the Peabody Conservatory yielded works for the wind ensemble and most notably a new program for composers who wish to learn to write opera, Opera Etudes. This program was designed to gather the disciplines of the Opera Theatre and the Composition department in a collaborative study. After singing several major roles with the Opera Theatre, Mr. Geiger was engaged to sing with the Baltimore Opera, and the Washington Opera where he continued to sing for ten years. During his time with the Baltimore Opera, he was contracted as a Composer/Facilitator of the program Create and Produce, sponsored by the Abell Foundation, where inter-city school students are introduced to opera by way of creating and producing an opera in their school. He also taught 16th-century counterpoint, functional harmony, and ear-training at the Baltimore School for the Arts for nine years. During that time Mr. Geiger was involved in many other composition projects, most notably the re-orchestration of Thea Musgrave's opera Harriet, the Woman Called Moses for the Skylight Opera Theater in Milwaukee, WI. Mr. Geiger has also written works for the Baltimore Choral Arts Society and Polaris New Music Ensemble. 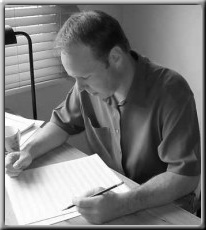 He has written for film, and completed commissions for solo voices, the Capital Saxophone Quartet, and various churches. Since moving to the Los Angeles area, Mr. Geiger has joined the faculty of Pomona College, and is a member of the Los Angeles Opera Chorus, the Los Angeles Master Chorale, and the Saint James Episcopal Church Choir, where his sacred compositions receive many of their premieres. According to the composer, his wife Akiko and daughter Anna are a continual inspiration.